Physics Buzz: What is a meltdown? Today, following the horrific earthquake and tsunami in the Pacific, the state of Japan's struggling nuclear facility, Fukushima Daiichi, remains confused and unclear. As those living and working near the reactors are evacuated and the rest of the world continues to watch, a small team of workers continues to try to bring the reactors under control. 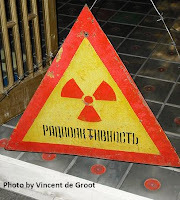 Recent reports say that even they have been forced to evacuate after high levels of radiation were detected at the damaged reactors. The most dangerous scenario involving an incident at a nuclear reactor is a nuclear meltdown, when the nuclear fuel (pellets of uranium dioxide, for example) that is housed in the core becomes so hot (around 3,000 degrees Celsius) that it and the protective metal tubing surrounding it literally melts, releasing large amounts of radiation in the form of harmful gamma rays. Should the heat cause an explosion damaging the outer housing that surrounds the core (a concrete bunker), that radiation could potentially be released into the atmosphere. Radioactive fuel generates a lot of heat which is used to turn water into steam that is then used to power turbines and make electricity. Though the heat-producing reactions in the core can be stopped (they were automatically shut down when the earthquake began), it takes a long time (on the order of days or longer) for the material to cool down to a safe temperature. Circulating coolant is required to keep the nuclear fuel at a safe and stable operating temperature. In Japan, all of the forms of coolant used at the reactors were thwarted by the earthquake, leaving only the option of pumping seawater through the reactors to ke ep them cool. Unfortunately, the seawater (and perhaps other contributing problems) is not doing enough and the reactors are continuing to heat up. A 50 to 200 man crew is working to keep the reactors safe, but as of this morning, even they were evacuated for at least some time. The core itself is housed in a concrete bunker (also known as a containment vessel or core shield) designed to contain any radiation leaked by the nuclear fuel in the event of a meltdown. (The failed reactor at Chernobyl had no containment vessel, leading to a large release of radiation after the explosions there.) What is unclear about the reactors in Japan is the extent of any reactor core meltdowns and whether or not any of the concrete shields surrounding the cores have been, or could be, breached. To see how the Fukushima Daiichi nuclear power plant works and what has happened to the reactors there, check out this very informative New York Times interactive graphic. In case you read the article titled, "Why I am not worried about Japan's nuclear reactors" by Dr. Josef Oehmen, a mechanical engineer at MIT (the original post has been removed) , here's a Salon article explaining why the post, originally an e-mail sent to family and friends, was discredited almost as soon as it went viral. The MIT Department of Nuclear and Science Engineering has posted an edited and updated version of original Oehmen's post. Though Oehmen's claim in the original post that radiation would not be released at Fukushima Daiichi has, according to Salon, been omitted, the thorough background information on how the reactors work remains. Who's right and who's wrong in the great nuclear energy debate remains to be seen, but what is certain is that the situation in Japan, where aftershocks continue to rumble, is still very serious. We at Physics Buzz, and APS as a whole, wish the people of Japan the very best.